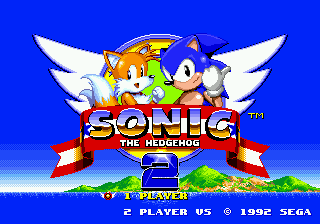 Back to: Sonic the Hedgehog 2 (Simon Wai prototype). The level select screen is a great deal bigger than it was in the Nick Arcade build, and uses Sonic 2 names. It's still a far cry from the final game though, and lists a number of strange levels in the wrong order. Still missing are Sky Chase Zone and Wing Fortress Zone. This screen also comes with its own theme now, rather than the silence heard in the Nick Arcade build and Sonic 1. This page was last edited on 28 April 2018, at 15:42.